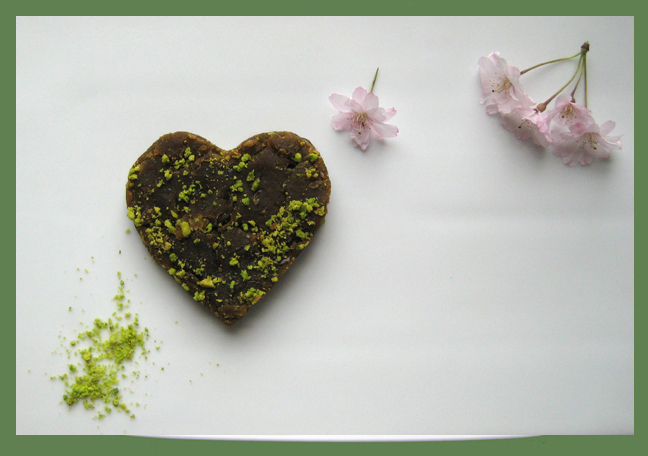 Halva is sweet but not considered a dessert in that it has doleful associations and is intricately tied-in with bereavement. 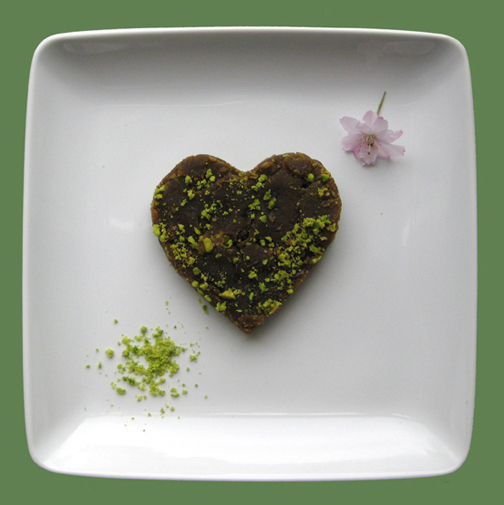 When someone dies, close friends and relatives make and distribute halva to the needy in the name of, and for the sake of the soul of the deceased – a gesture practiced by the religious and secular alike. (This idea of paying personal, emotional, respect may explain why halva, unlike most other Persian sweets, is almost always made at home and not purchased.) Halva is also foremost amongst the food customarily served at wakes and memorials. Which makes sense when you think about it: halva is a comfort food and thus a solace; and it smells good and tastes sweet, which can momentarily brighten a bleak occasion by delighting the senses; but it is also a mild food in flavor and sedate in demeanor – nothing too flashy or jovial about it despite the pistachio sprinkles – perfectly suited to the tone of a somber occasion such as a funeral. Now there’s another (entirely distinctive) type of sweet that we call halva ardeh in Iran but which is widely known as halva everywhere else: a block-shaped confection with a dense dry texture that crumbles when you cut into it; popular in Turkey, Greece, all across the Middle-East, Eastern Europe and a whole bunch of other countries besides. Iranians don’t treat halva ardeh as a dessert either and have it for an occasional breakfast treat or an afternoon snack – usually with some bread. 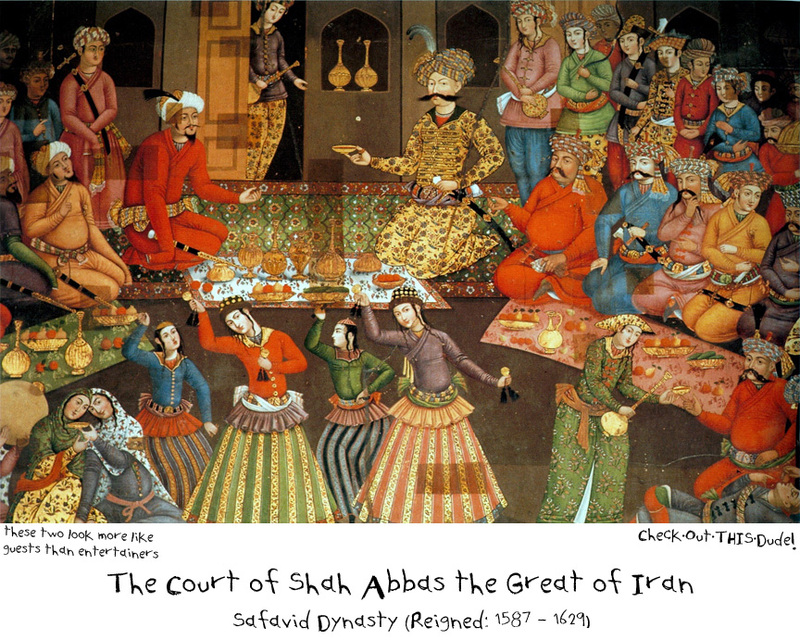 It is said that Shah Abbas tasked one of his trusted advisors (Sheikh Bahayee: a philosopher, mathematician, astronomer, and poet) to concoct a compact, nutritious and portable food for his army. After due diligence, Sheikh Bahayee came up with the original halva ardeh recipe: ground sesame (rich in protein and iron) mixed with grape syrup – end result being a durable, palatable, highly-caloric food that traveled well. (Speaking of the grape syrup part of the recipe, a Persian proverb, preaching perseverance, goes like this: “With patience, we can make halva with unripe grapes.” Indeed. Indeed.) So! 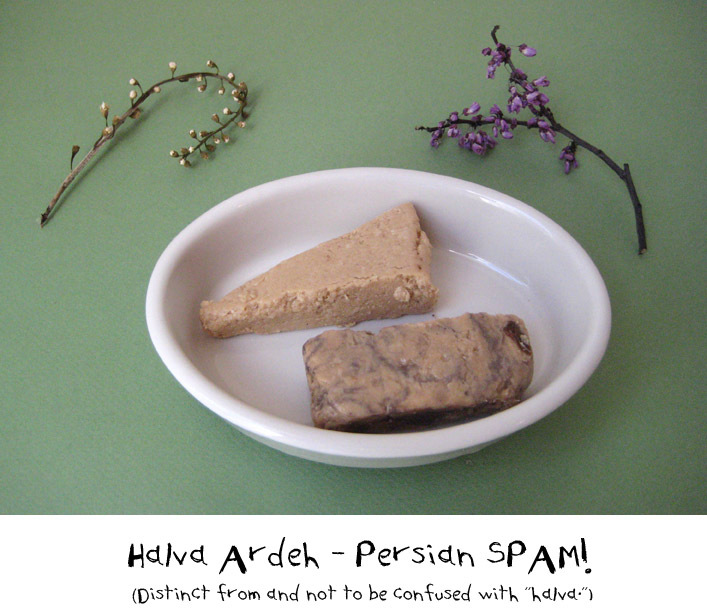 It turns out halva ardeh is an early iteration of … SPAM? That’s kind of … amusing! I can’t pass up this opportunity to chat just a tiny bit about Shah Abbas the Great – one of the more significant rulers of Iran. On the glittering bright side, his reign was a true golden age for Persian arts and humanities — calligraphy, miniature painting, mural making, carpet weaving and design, illuminated arts, book binding, and architecture all flourished under his rule – a brilliant and enduring legacy, which includes the poetically beautiful city of Isfahan. On the downright horrific side, he killed one son and blinded the other two due to ill-proven suspicions of their usurping his throne, terrible acts which apparently threw him into a depressive funk. Which, no kidding … dear God! And on the facial-hair-side, which may just become a de-facto theme of this blog (to wit: see that other fabulously-mustachioed king) Shah Abbas shaved off his beard at the age of 19, keeping only his mustache, thus setting a fashion trend in Iran in his time. Note the 3 separate cloth-spreads of food (or what we call sofreh in Persian, used to set/serve food before the Western dining protocol became commonplace) set in front of the seated guests. Also note all the hipster mustaches (but no beard for the Persian guests – per the fashion trend of the day set by the king! The Uzbek guests have not received the memo and still sport beards.) The fruit served seems to be a mixture of apples, pears and plums and … maybe pomegranates? The woman at the bottom right is pouring a beverage for a guest – I wonder, what kind of beverage? This was 17th century Iran, well after the conquest of the Persian empire by Arabs and the advent of Islam, but m’ey (a poetic and generic term for “intoxicating drink,” i.e booze) is all over Omar Khayams’s poetry and … let’s just say I would not be shocked if the woman is a saghi offering a libation that is more potent than juice. To have been a fly on the wall! Someone invent a time machine already! Cook lentil and water (enough water to cover it about an inch or so) to a rapid boil; reduce heat to low and cook slowly until water completely evaporates. (Approximately 30-45 minutes, perhaps a bit longer.) Drain well. With the aid of a tenderizer (or the back of a wooden spoon, etc.) 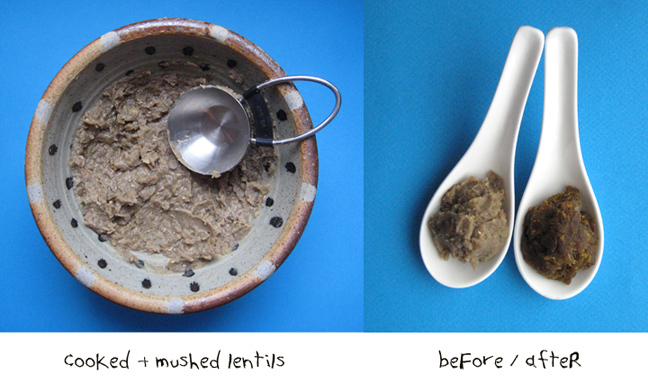 squish lentils and create as mushy and smooth a texture as possible. Heat 1/2 cup of olive oil in a wide pan over medium heat. Once you hear the oil sizzling, pour in the mushed lentils and saute for 15-20 minutes or until the lentil puree subtly darkens in color. Transfer halva to a serving dish and smoothly spread it evenly (using your fingers or a kitchen tool) across the surface. If you wish, you can indent decorative ridges on the surface with the aid of a cookie cutter or another tool. It is optional, yet traditional, to garnish with whimsical patterns of ground pistachio and slivered almonds. Slice wedges to serve, or just dole some out with a serving spoon. Savor as it melts in your mouth. A spoonful or two of lentil halva makes for a little sweet pick-me-up-whenever snack, as well as a nice treat that goes quite nicely with afternoon tea. You can also eat halva with flat bread and make a meal of it. Super yum. That’s it folks. Nooseh jan! There is a specific food called “nectar”? I should look that up. & thank you re delightful compliment. I can in good conscience return it to you in full! Mersi Laura joon! 🙂 First rule of a Persian food night is to add a “joon” or “jan” to everone’s name! Ha ha. And finally, wow, how fun, and I truly WISH I could fly over and invite myself to what I’m sure will be a really wonderful dinner party. Hopefully you’ll do a blog post with details and pix?? I absolutely love your posts! Always beautifully poetic and visually stimulating. I first tried halva in Greece several years ago. I really enjoyed it and after trying halva a fews time here in the states have not been impressed at all. Your pistachio garnish is gorgeous and I am sure it gives a perfect taste. Oh, and the heart….sigh. I check my email first thing in the morning every day, when I see a post from you I read it but don’t comment immediately, the reason for that is that you produce such a beautiful piece of work I have to absorb it, does that sound stupid? I love the halva, and as always masterfully written, photographed and executed. OK, Suzanne, that’s among the sweetest things any one has said to me. I actually read your comment on my phone just before I was about to hop on the subway and throughout the ride I was absorbing it and buoyed by it with a goofy smile I couldn’t suppress! Thank you!!! Fabulous post Azita. I love the cultural orientation accompanying the recipe. We visited a fabulous exhibition last year of illuminated Persian love poems, gorgeous gilded miniatures dating back 500 – 600 years. They were a delight to see! Your photo of the feasting king brought them to mind. Thank you! I’m so happy to read this, Sandra, because I often think I should aim for more concise posts instead of rattling on and on, so it’s really good to know that it is of some interest and I’m not boring you to tears. I doubt if you could ever bore anyone to tears. Well, certainly not in the blogosphere. Like everyone else I relish your writing. And your recipes. Seriously? Lentils? Who knew they could be this delicious. I’m off to the small International store next week so I must buy in rosewater and saffron, the latter for one of my favourite chicken dishes, a cardamom and saffron (there’s a surprise) dry curry. Ha ha, I see what you were doing there. Thank you and yes, lentils, which I think is healthier than frying flour – and apparently it’s possible to substitute any number of cooked/mushed up legume such as beans, or use even cooked beets to mix and cook with the syrup to make the halva. IF you try the recipe, do let me know how it goes. I love your posts… they are so delicious and so educational! Your photographs are so beautiful. I was so interested to read all about the history too. This is the second time you have mentioned men’s facial hair it made me start to think of how it appeared during the centuries. I hadn’t really thought how important it was. Your research and wonderful recipes are always something I love to read. Ha ha, yeah, I seem to have have fallen into an unintentional men’s facial fashion subtopic – and for sure, it’s hard to resist commenting on the rather dramatic ways men used to wear their mustaches and beards, etc. I’m so glad that you enjoy reading about these things … it’s definitely fun to share as well. I am really glad I found your blog! it is like a window into a world I find enchanting! I only know the halva made of sesame seeds, the idea of one made of adas (that is the arabic word for lentils too) is beyond interesting! Oh no idea that adas means lentil in Arabic as well but in the course of writing this found out (at least per Google) that halva means sweet in Turkish and also Arabic? Yes the sesame seed halva is what we call “halva ardeh” which is entirely distinct from the pastry-type of halva. What an interesting post! Thank you for the insight on the history of halva…something that is very new to me. I am really only acquainted with the “sweeter” variety. Thank you! I’m enchanted by the many interesting and pretty things and customs and glimpses I’ve found/seen about Finland through your blog and happy to return the favor in turn to some degree. Azita, I enjoyed reading this post- I love food, I love history and I absolutely love the history of food! We (in India) make many halwas- But the quickest comfort food equivalent, is made of semolina or wheat flour. That sounds healthy, but its usually floating in ghee and is about 5000 calories per spoonful. That’s awesome – thank you – I agree that history of food is just … delicious! 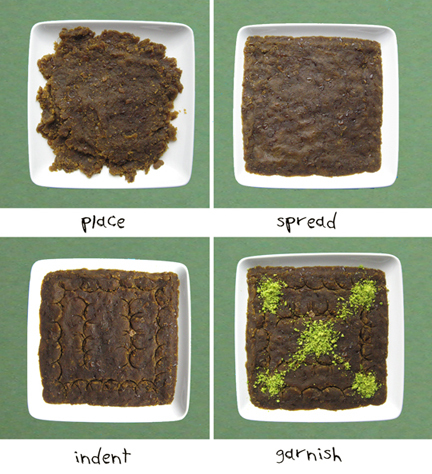 Just Googled some Indian Halwa, and yup, looks quite look ours. I’d say I’ll run out to buy some somewhere but then I hear the ominous echo of “5000 calories” which: heh! So ghee … never made it myself but I really should explore it – I’ve heard of it of course. So VERY haPPY to know you as well! A lot of North Indian culture borrowed heavily from the Persian court- because of the Mughals. So, while I don’t know whether halwa was an import or an export- we make halwa from carrots, beetroot, bottlegourd, ash gourd, moong lentils in addition to the semolina and wheat flour varieties. Wanted to ask, but forgot, was your halva made from moong lentils? And ghee is really easy to make. Just boil butter until the milk solids separate. How ineresting! Thank God for the Internet so that we can exchange notes with each other from across the world. I do know that both carrot and beetroot are used in contemporary cuisine of Iran back home, from what I’ve heard and also what I’ve found on Persian webpages. 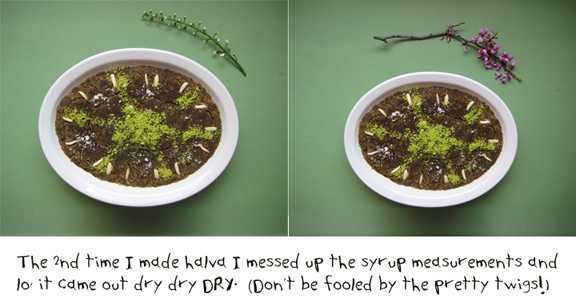 Lentil is supposedly a forgotten dish – recipe found in that cookbook I mentioned in the post. I used ordinary lentils, but you can use moong if you’d like. Now, you’ve got me both stomped and intrigued as to exactly what bottlegourd and ash gourd are? Ok, gourds are water based vegetables that are used a lot, in tropical countries. Ash gourd is also called white pumpkin or “kaddu”. The chinese call it winter melon. And bottle gourd, is called “lauki” or “dhoodi” in Hindi. In addition there are many other gourds used in Indian cooking– ridge gourd, bitter gourd, snake gourd etc. Most Indian restaurants won’t serve you these (glamorous) veggies, but homecooking uses are these and more. Ghee, is made in a very similar manner to browned butter (for cookies, cakes etc.) but is cooked only until the sediments turn brown. If over boiled, the ghee is too soft (slimy?) with no texture. Perfect ghee is golden and grainy when semi solid, and a clear molten gold when liquid. I use unsalted butter or Lurpak to make my ghee. You’ve got to watch over it, because it will boil over rapidly, and you’ll lose half your ghee in an instant. 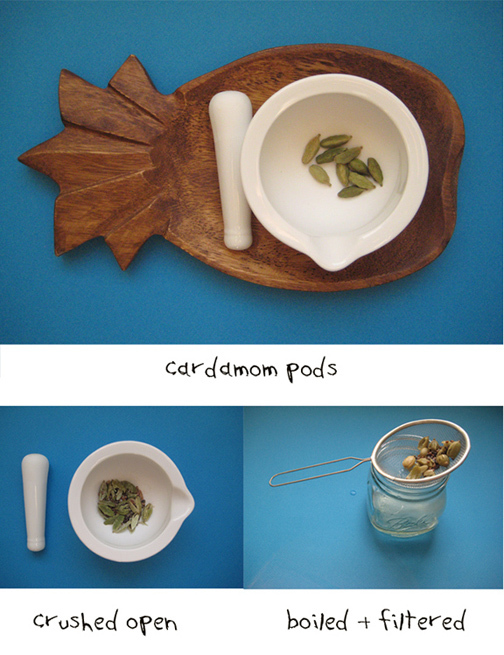 We use it to do the “tadka”, (tempering) for our dishes. Make our pulaos with it, and of course our halwas. Sorry for such a long winded comment. What a great post, Azita jan! Most contents refreshingly new information to me. I had never heard of lentil halva or other vegie-halvas you mentioned. There is still a lot we can learn from one-another.